Noted: *Only applicable to user who has registered e-Signature in Citibank CN App. More user-friendly Interface: Tidy and simple to navigate via regrouping functional category, introducing right-side portals. Personalized: Targeted messages to provide most relevant information. How to register Payee Online? Step One：Select "Transfers and Remittances" and select "Add Payee" to begin enrolling. Step Two: Select "Payee Account Type". Step Three: Fill in "Payee Name" and account number. Step Four: Click "Activate Payee". Step Five: Fill in OAC. Step Six: You have added the payee successfully. For details, make an online appointment now at your convenience, You also can reach us via our 24-Hour Service Hotline at 400-821-1880 or 800-830-1880 (For land lines within mainland China). If you are overseas, please call (+86)-(20)-3880-1267 (Personal and CitiBusiness customers) or (+86)-(21)-3896-9500 (Credit Card customers). Payees are your pre-registered account numbers with us before you can do funds transfer. Once you have set up your payees, you can transfer funds to them anytime. 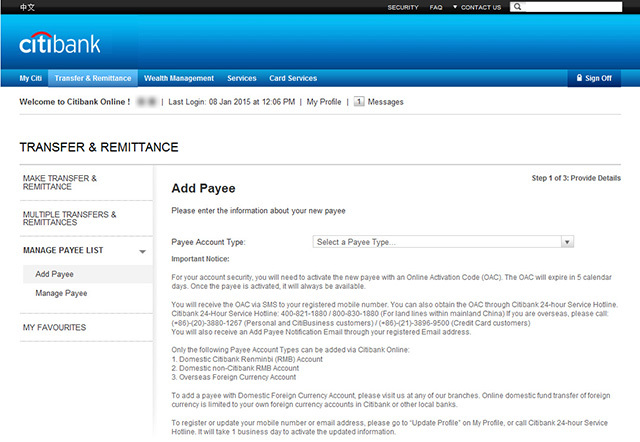 You can set up your payees in the branch or through Citibank Online. What type of payees can I set up via Citibank Online? You can add the following payee types via Citibank Online: Local Citibank RMB Account, Local non-Citibank RMB Account, Overseas Foreign Currency Account. Once you have added your payee, a 6-digit Online Authorization Code (OAC) will be sent to your registered mobile phone number with us to activate your payee. The OAC serves as an added level of protection. This is to ensure that only person(s) you have properly authorised can have funds transferred to them. What type of payees can I set up at the branch? You can set up all payee types via the branch. They will include the following. Note that if you are adding a Local Foreign Currency account, documentary proof is required to show linear relative relationship. What is the Online Authorization Code (OAC)? Citibank Online Authorization Code (OAC) acts as an authentication for online transfers and payments from your account to all new payees. Whenever you set up a new payee for an online Funds Transfer or Payment, a 6-digit OAC code will be generated instantly for you to activate the new payee before you make the transfer or payment to this new payee. Your new Payee is now successfully activated and you can proceed to transfer funds as normal. Do note that you will have 3 tries to activate your new Payee and your OAC expires after 5 calendar days, after which your new Payee will be deleted off your list. You only need to activate the new Payee once. The next time you want to transfer funds to this Payee, you can do so directly without going through the activation steps. I did not receive my Online Authorization Code (OAC). How do I obtain it? Can you send it to me again? OAC will be sent to your registered mobile phone number with us. Note that once the OAC has been issued, it cannot be re-issued. If you do not receive your OAC, you may also call Citibank 24-hour Service Hotline(400-821-1880) to get your OAC. Who can I transfer funds to via Citibank Online? 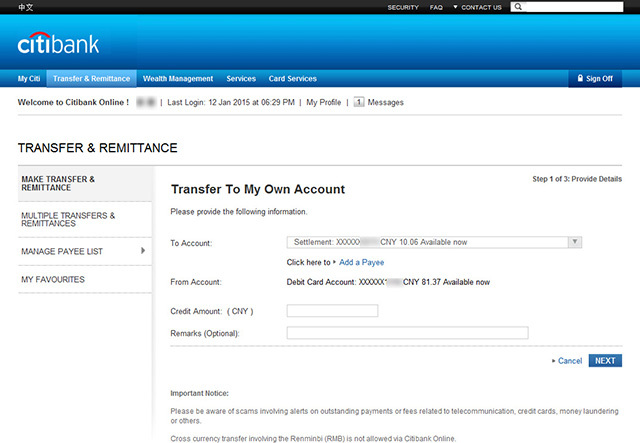 You can transfer funds to any of your Citibank Accounts or your pre-registered payees via Citibank Online. What are the different types of Funds Transfer available via Citibank Online? Citibank's prevailing exchange rates at the time of processing will apply. What are the advantages of Online funds transfer? There's no more queuing at the bank! You can make a funds transfer electronically directly to your payees. How shall I use the One time password received by SMS? You should receive one time password on your registered mobile phone number shortly. Please keep your browser on this page while waiting for your password.Upon receipt, enter the password in the field provided and click "Continue". If you require assistance, please call Citibank 24-Hour Service Hotline at 400-821-1880 or 800-830-1880 (For land lines within mainland China). The mobile phone number shown on the screen is not my latest number. What should I do? · Successfully log on to Citibank Online and choose “Change Contact Information” from “Edit Profile and Preferences”. One time password will be sent to your registered mobile phone, you are required to enter for authentication before updating the contact details. Do I need to click anything to trigger the one time password SMS? The one time password SMS will automatically be triggered to your mobile phone number when you click on an online transaction that requires one time password. I have not received my one time password via SMS. What should I do? To ensure your current mobile number is the one that you registered in the bank, then you should receive your one time password SMS within one minute. If you do not receive it, please call our 24-Hour Service Hotline at 400-821-1880 or 800-830-1880 (For land lines within mainland China). I received more than one SMS containing one time password. Which one should I use? Only the latest one time password SMS you received will be valid. So please use the most recent SMS. How long is the one time password valid? The one time password is valid for 2 minutes. If you key in a password that has expired, a new password will immediately be sent to your mobile phone. What happens if I enter the wrong one time password? If you continuously enter your OTP incorrectly 3 times, your internet access will be locked and you will be unable to log into Citibank Online. Please reset your password on Citibank online to unlock your profile. For more information, please call our 24-Hour Service Hotline at 400-821-1880 or 800-830-1880 (For land lines within mainland China).